CLCWA Vice President Bob Savely, from left, along with John Jacobs of the Texas A&M Coastal Watershed Program, CLCWA President John Branch, Exploration Green Conservancy Chairman Frank Weary, Harris County Commissioner Jack Morman, State Rep. Dennis Paul, Jordan McGinty, representing Houston City Council Dave Martin, and CLCWA Director Gordon Johnson, officially open Exploration Green with a tree planting ceremony. Photo by Marianne Dyson. An estimated 1,000 Bay Area residents were on hand to celebrate the long awaited grand opening of Exploration Green — the 200-acre green park developed at 16205 Diana Lane to save Clear Lake City homes and businesses from flooding during heavy rains. As elected officials, community leaders, families and community groups gathered for the historic occasion, several who had worked on the project for a number of years — Clear Lake City Water Authority President John Branch and Vice President Bob Savely, Exploration Green Conservancy Chairman Frank Weary, Harris County Commissioner Jack Morman, State Rep. Dennis Paul, Jordan McGinty, representing Houston City Council Dave Martin, and CLCWA Director Gordon Johnson — officially opened Exploration Green with a tree planting ceremony. Exploration Green is being credited with preventing 100 million gallons of Harvey storm water from flooding Clear Lake City homes. 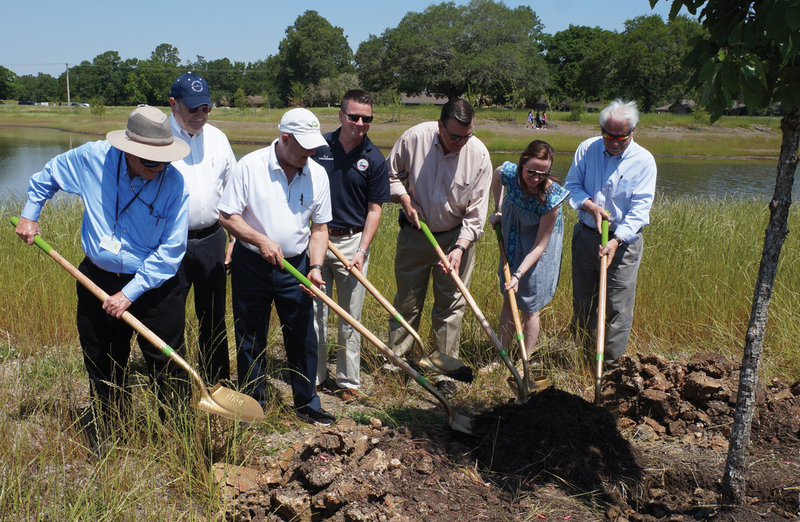 Over 750 native trees have been planted at the eight-acre detention lake and habitat island that was formerly the Clear Lake Golf Course and Clear Lake Country Club. The new hike and bike trail – with benches for resting put in by Space Center Rotary members — will help everyone explore Clear Lake’s biggest new park. Hundreds volunteered to make Exploration Green theirs, and after years of planning, 340,000 cubic yards of soil excavation, fighting Harvey’s stormwater, creating a habitat island and installing a beautiful trail, their dream became a reality with the grand opening Saturday, April 28. Besides the ground breaking ceremony, other activities included the reading of a proclamation issued by Houston Mayor Sylvester Turner declaring it Exploration Green Day, live music by local performers, “Grifters and Shills” and “School of Rock,” a Kid Zone, a “social” run, plant sale, fitness activities, kites, Houston Police Bike Patrol, NASA Virtual Reality and food trucks, plus organizations handing out flood control information, environmental tips and green guides. For information about Exploration Green’s volunteer opportunities or contributions to the Exploration Green Conservancy, a 501(c)(3), visit www.ExplorationGreen.org or www.Facebook.com/ExplorationGreen.